Britain’s got Talent returns to our screens this Saturday night, and we’ve been looking over the acts from last week to add to the bets we’ve already recommended on this series. Last week we suggested bets on young singer/songwriter Henry Gallagher, as well as 162-piece Choir, Cor Glanaethwy, who both took our eye in their auditions. Last Saturday’s show saw the usual eclectic mix of acts that only Britain’s got Talent can attract. Among the eccentric array of performers was Musical Ruth, better known as Matthew Hunt, who sang an awful rendition of ‘Give me Oil in My Lamp’ while whizzing around the stage on a motorized piano. David Walliams couldn’t resist having a ride around the stage with him, but probably took the joke a little too far for Simon Cowell’s liking. Bill Picton-Jenkins attempted to break the world record for the number of jokes told in one minute but failed, and predictably was sent packing; while Vince Venus only managed one line of ‘I Want to Break Freee’ before being buzzed off – which was probably for the best. There were some awful singing performances which prompted a war of words between the Judges, with Simon suggesting David should start a record label. Walliams played along nicely with the joke, telling awful performers Paul Netterfield, Eric Kovac, and Paul Manners that he’d like to add them to his ‘roster of acts’. Manners was a particularly hilarious singer, who managed to forget the words to his own song mid-performance. His claim to fame was that he had hosted Peter Andre’s brothers wedding, and his performance would suggest that’s as good as it’s going to get for him. Inexplicably, he was allowed to progress after Simon was the only one to say no. The episode didn’t get any less surreal as the night wore on, but lets have a look at some of the performers who actually possessed a little bit, of erm, actual talent. Lisa Sampson entered the stage carrying a bunch of hula-hoops, prompting Simon to sarcastically ask what her act was. Any skepticism about her ability was quickly brushed aside as she produced a fabulous performance, spinning hula-hoops in places you didn’t think was possible. She had a really sweet nature and enthusiasm about her, and after some of the tragic acts that had gone before, she provided welcome relief. Four ‘Yeses’ followed, and she will get her chance in the semi-final. Undoubtedly a fun act, but it’s probably unlikely she could go on and win, and that’s reflected in the odds. Young Isaac Waddington chastised the audience for the ‘Aaahh’ they gave him when he told them he was 15, saying ‘It’s not that young!’. His performance was certainly that of a man mature beyond his years, as he produced a captivating rendition of ‘She’s Always a Women’. His soulful voice made it a great performance, the relationship with his brother, and his Dad crying in the audience (which the producers were keen to show us), will lead to him gaining plenty of followers. Whether or not he’ll win is another matter, but it would hardly be a surprise to see him releasing records under Simon’s label at some point in the future. 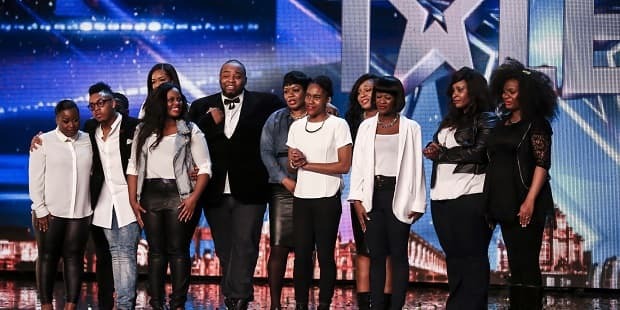 Amanda pressed her Golden Buzzer for Revelation Avenue, a gospel choir who produced a flawless version of Katy Perry’s ‘Roar’. They appeared after yet another choir – Affinity, a women’s group from Stockport – who showed how not to do it with an awfully out-of-tune performance. Revelation Avenue were something of a breath of fresh air following their showing, and it was all very nicely set up. Simon has already mentioned that he thinks a choir could be this year’s winner, and with Revelation Avenue and Cor Glanaethwy, there are two strong contenders. This performance was much more contemporary than the Welsh group’s, and it will be interesting to see how both fare in the semi-final. IMD Legion were utterly impressive with their well-choreographed dance routine, but after Diversity won the show all those years ago there have been many dance groups attempting to follow the same route, and this felt a little unoriginal. The performance was exceptional, no doubt, but with the matching outfits and strict routine, they didn’t possess anything new or different. They deserved to go through however, and it remains to be seen if they can bring something new to the table in their next performance. The show started to border on the farcical when Krystyna Lennon and Princess the Hypnodog entered the stage, as she proclaimed that she owned the only canine hypnotists in the world. Strange things began happening as members of the audience and Ant & Dec all fell asleep after looking into the dog’s eyes, and were hypnotized into thinking that the number 7 did not exist. Simon then decided he would have a turn, but it appeared that nothing had happened when he returned to his seat. However, as the show progressed he showed visible signs of tiredness and suddenly began to start to act very peculiarly – he was being nice. For a short while Simon appeared to like some truly awful acts, and criticized the other judges for being too harsh on contestants! It all seemed in good fun, although Twitter was awash with fans later calling it a fake and a set up. Either way, Ant & Dec’s revelation that they had to spend about half an hour with the hypnotist and her dog in preparation before the show, took the shine off a little bit. Great TV, great publicity for the act, but unlikely to be considered as a winner. We’re going to add one act to our stable from last week’s show, and we’re hot on the choirs this year so it’s Revelation Avenue that we’d recommend a small bet on to win the show.